When you consider all the distractions around the house, even a dedicated home office may not cut it as the perfect out-of-office workspace. Outdoor offices offer privacy and peace that you can’t get in the family home. Working from the kitchen bench is OK as a one-off, but as a business professional, you know a dedicated workspace is highly necessary for focus and clarity. But we are no longer limited to converting the guest bedroom into the home office – technology has opened up many doors and the ability for you to work from an outdoor office has been made possible with wirelessly connected devices. Is an outdoor office for you? Your home has all the qualities that an office doesn’t; home is the space for privacy, for relaxing, for family and fun. And when the dog’s barking at the TV, blaring at full volume, and the kids are bouncing around the house, it’s a challenge to work effectively, even in a home office. On the other hand, a purpose built outdoor office will be designed with your work needs first and foremost in mind. You get the benefits of a (very) short commute and being close to home, but the separation of home and work life so that when you sit down at the desk in your outdoor backyard pod, you’re immediately in the zone. An outdoor office done right can be as productive a work environment as an executive office at 101 Collins Street. When you close the door to your outdoor office behind you, you have your separate space for business which is comfortable to work in and aids productivity. Harwyn designer pods are purpose built, pre-fabricated outdoor offices. Ordering an outdoor office from Harwyn is as easy as ordering an iPad; all you have to do is to choose your colours and options. From there, we take care of everything. Visit the Harwyn showroom for the full experience and get in touch to find out more. 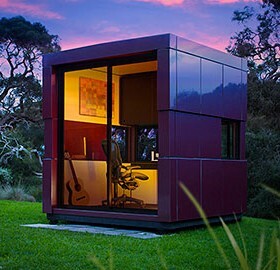 A outdoor garden studio that shines Reclaim the home office Media Release – make your home office work Want to maximise your productivity at home?